Permanent, mechanical crash attenuators are recommended to be installed for protection of any permanent roadway hazard such as bridge abutments, guardrail, toll booths and overhead sign structures. Permanent, mechanical crash attenuators are usually placed in front of a fixed structure on city streets and highways. The intent is to protect the motoring public from striking one of these hazards without the proper end-treatment protection. Permanent mechanical crash impact attenuators are designed to absorb the colliding vehicle's kinetic energy. In addition to absorbing the kinetic energy, some permanent mechanical crash impact attenuators models can also be used as a redirective non-gating end treatment thus, saving more lives. Permanent mechanical crash impact attenuators are anchored to the ground as well as the hazard itself, like concrete barrier. Permanent mechanical crash impact attenuators are required to be installed on a level concrete of asphalt pad. 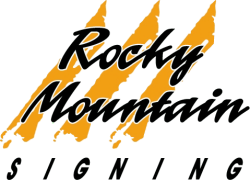 Rocky Mountain Signing can supply, deliver, install and repair your crash attenuators. This attenuator truck was struck at over 70MPH on 1/30/2019. Both drivers survived. The driver of the car was taken into custody.